Episode Name: "Born This Way"
Barbra Streisand and Sunset Blvd in one episode. Why am I not happier? So. Glee last night. I thought it was pretty good. Definitely didn't live up to my ridiculously high expectations, but thats ok. Anyways. As far as songs/performances goes, it was excellent. Somewhere only we know was phenomenal. I wish BTW performance was a little longer since they did cut out a large part of the song. Santana (by far, one of my FAVORITE characters along with Brit and Mercedes) was hilarious. It didn't even feel like a 90 minute episode, it seemed normal. But nonetheless, it was a good episode and of course I am glad that Kurt is back haha. I actually thought it was a pretty good episode. I think my only complaint is how Born This Way wasn't an actual cover, but just Gaga being played over a stereo or something /: Though I did love the dance for the song. I'm kind of neutral on the lack of Sue in this one. Quinn's story was kind of stupid, but it was worth it for Lauren to interact with another character. Lauren has felt too limited for too long, so I've enjoyed her recent development with Mercedes and Quinn. And I liked how Finn accepted her, even though I think it'll lead to him getting back with Rachel. The goodbye scene to Kurt from the Warblers was great. In a way, I'm kind of glad Kurt's back at McKinley. We'll get to see more of his eye-popping outfits (I seriously wish real teens dressed with as much fashion as the cast on Glee -___-). I also loved the mall scene. Leave it as SLJ or Pancakes. Well, I just don't like many of the cast... pretty much none of the kids now, not Will. 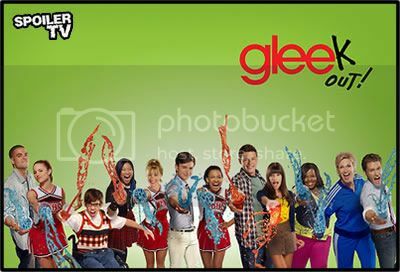 I love Beiste and Sue though they weren't in it. Emma was good. I actually really like 'Somewhere Only We Go' (and a lot of the Warbler songs) but I hate how it was all about Kurt. His song was long and dull. I can't even remember much of BTW. I don't blame you for not liking most of the characters. I liked pretty much all of them come their introduction, but too many characters are severely over saturated, which ruins the majority of the cast. Finn, Quinn, Kurt, Rachel, Puck, Blaine, Sam, and Lauren seem to be the main culprits right about now. Granted, I am a huge Kurt fan, but I'm starting to feel that the show has been revolving around only him lately. Save for Kurt, the lesser-used characters seem to be getting used a little over the course of the seasons final trimester. I'm happy about that. And it looks like Blaine might be gone for the rest of this year, and Sam is finally learning how to stay in the background, like a good guest star. I ordinarily like Sue a lot, but she's become...different lately. She just isn't Sue anymore. Beiste has grown on me, I'd like to see a bit more of her. I kind of want Will to end up with her in the long run. Emma is one of my favorites. She's been sooo neglected in season 2 D,: I like her with Will, but at this point, I feel they don't deserve each other anymore. Now, I want her back with Carl.